Following World War II, the parish of St. Columba outgrew its original 1915 church. 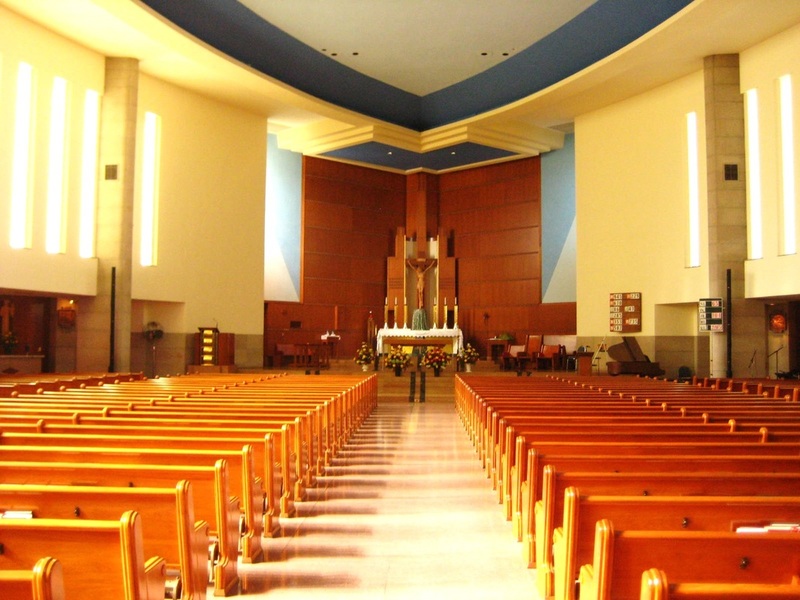 Barry Bryne, a designer who studied under Frank Lloyd Wright, was hired to design a new church in the modernist style. The church’s smooth cream-colored limestone veneer is punctuated by tall, narrow windows which bath the nave in soft light. Bands of horizontal windows containing blue and yellow stained glass delineate the side aisles. A stylized granite cross is prominently featured above the main entrance. [i] Millett, Larry. AIA Guide to the Twin Cities: the Essential Source on the architecture of Minneapolis and St. Paul. The Minnesota Historical Society Press, St. Paul, MN, 2007. Page 567. [ii] Wikipedia, Ichthys: http://en.wikipedia.org/wiki/Ichthys 8/18/2013.